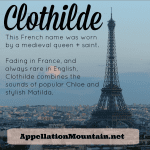 Let’s look at a warrior queen with a clunky-cool name, immortalized by legend and opera. Thanks to Sarah for suggesting one of her favorites! 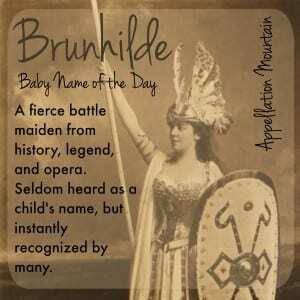 Our Baby Name of the Day is Brunhilde. Brunhilde sounds like a bruiser. 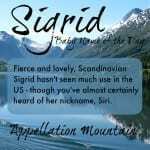 Her name comes from the Germanic brun – armor – plus hild – battle. While Matilda and a few other hild names have come into general use, Brunhilde has remained the stuff of history and legend. Back in the sixth century, a Visigoth princess usually called Brunhilda (and sometimes Brunehaut) married King Sigebert I of Austrasia. Sigebert and his three brothers had divvied up the Frankish kingdoms amongst themselves, and Sigebert’s brother, Chilperic, married Brunhilda’s sister, Galswintha. Chilperic and Galswintha were miserable from day one, and Chilperic quickly had his bride murdered and married his mistress, Fredegund. The resulting turmoil lasted over the generations. First Siegebert and Chilperic went to war, and then succeeding generations of cousins did the same. Brunhilda served as regent for her son, then grandsons, and finally for a great-grandson. But over the years, high-ranking nobles became suspicious of the queen. And the queen herself seems to have become ruthless. Early days, she repaired churches and roads and fortresses and re-organized the army. As a great-grandmother, she schemed and ordered her enemies assassinated. She’d live a long life, but in her seventies, Brunhilda was arrested, accused of treason, tortured and excited. Not a happily ending. Let’s move on to Brynhildr, legendary Queen of the Valkyries, based on the historical queen. She appears in Norse mythology’s Völsunga saga as well as the Germanic Nibelungenlied. In the Võlsunga, Brynhildr angered the god Odin, and so was forced to live her life as a mortal. The hero Sigurd rescues her and they fall in love. Except there are complications. Sigurd is enchanted and forgets his love, so they both marry others. Drama follows. The story of the Nibelungenlied isn’t very different, only this time Brunhild is queen of Iceland, and Gunther and Siegfried are vying for her affections in a series of competitions. Gunther wins, but not without Siegfried’s (considerable) help. 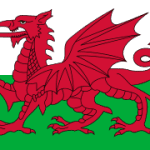 Both legends are the inspiration for Richard Wagner’s Der Ring des Nibelungen – the Ring Cycle. I can’t do justice to the epic tales in this space, but even if you’ve never heard a note of the opera, an awful lot of it has trickled into pop culture, from Bugs Bunny to Xena: Warrior Princess. There’s a comic strip witch called Broom-Hilda, and in the movie Django Unchained, Django’s wife is Broomhilda. There’s also a brief mention of the Brynhildr legend in 2013’s Vikings series. And then there’s the Marvel Comics heroine sometimes called The Valkyrie, sometimes Brunhilde. With her enchanted sword and winged horse, she’s not exactly faithful to the Norse legend, but she’s undeniably a fierce warrior maiden. Brunhilde is one of those interesting cases – we recognize it instantly as a name, and from some patchwork of Looney Tunes and myth, we have a sense of the character as fierce and commanding. But none of the spellings has ever been used in the US, except for a very few occasions. And Brunhilde feels a little clunky nowadays. Still, if you’re a fan of opera or just the legend, Brunhilde could be an intriguing choice for a daughter’s middle name – or even a very daring first. What do you think of Brunhilde? Too clunky to consider? Or an undiscovered gem? Broomhilde is the name of Maid Marian’s servant in Mel Brooks’ “Robin Hood Men in Tights” and it’s pretty much all I can think of when I hear Brunhilde. It’s pretty long without a good diminutive option. I hear Elmer Fudd’s ‘Oh Brunhiiilda, you’re so wooovewy,’ but that doesn’t ruin it. There’s a recurring character in Elizabeth Moon’s Serrano books named Brunhilde “Bubbles” Meager. There’s a line in one of the books about her parents being into clunky, really old-fashioned Old Earth names. She starts out as an airhead, but quickly becomes one tough cookie. She’s referred to as “Brun” in most of the books. Funny that this name becomes the noftd. I was just reading about in the book, Domestic Tranquility, it has been used as term to exemplify the opposite, for the none-feminist. None-feminists have been saying that “Brunhilde has awaken. She is a symbol of femininity, fragility, nurturing, and strength. 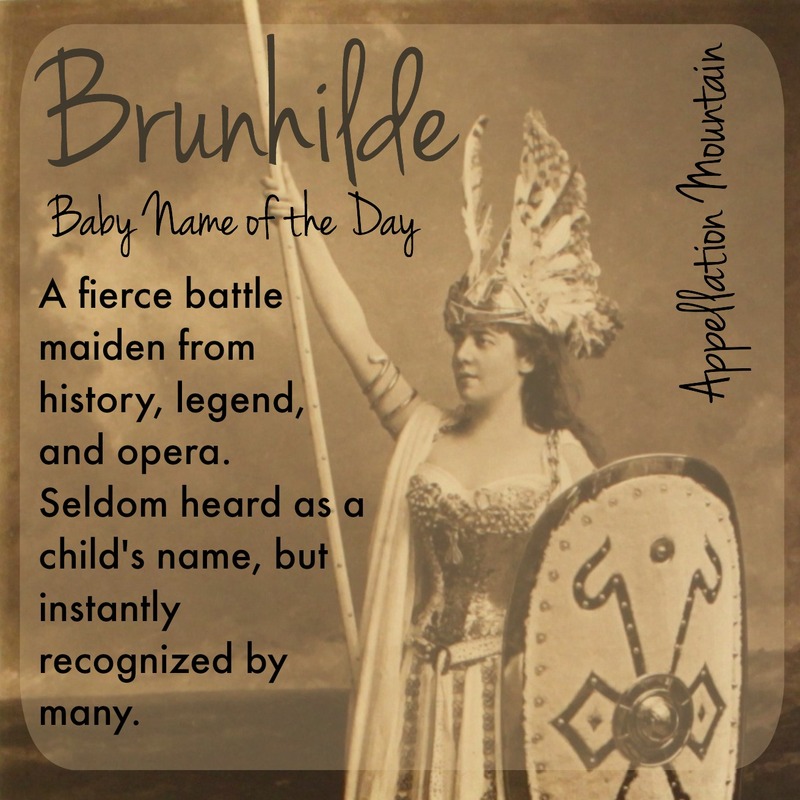 Brunhilde is a women on her vengeance to take claim to the rightful position with protection and respect for the everday housewives and mums out there…” Fascinating name, it is clunky. But clunky can be charming. It reminds of a piece written up on nameberry about some people’s name styles fall into different categories. Brunhilde seems to fall into the eccentric Aristocratic name style. She has an eclectic old money feel, with the cutesy nickname, Hildy, to make her friendly and approachable. Making her all together less threatening, less icy and less formal. I wouldn’t be shocked to meet a Brunhilde, I’d be tickled pink. Something new, or feels new, beyond Matson, Hayden, Peyton, braydon generation. Brunhilde is fascinating, but, I think, too much for a modern girl to carry. It does put me in mind of one of my absolute favorite names, Griselda. Has Griselda been name of the day? If not, could it be, pretty please? I tried, completely unsuccessfully, to talk the husband into naming our last Griselda. Oddly enough, his response was why not just name her Hildegard or Brunhilde? I must be in the minority thinking Griselda much more comparable to Matilda or Penelope. Griselda is up on April 23! Yay! I can hardly wait! Hooray! I think I suggested Griselda – can’t wait to read what you’ve got to say about her! I completely agree with Kristin that Griselda is more wearable than Brunhilde – to me, Brunhilde is inescapably heavy, where as Griselda has a silvery lightness to it. I don’t think Brunhilde is particularly wearable — but the Norse influenced version Brynhild has loads more potential.